** Editor’s Note: The staff of Scienceline is taking a short break to work on future stories. In the meantime, we will repost some of the site’s most popular articles from the last six months. We will return to publishing new content on May 19. This article originally appeared Feb. 11. In 1967, Mr. McGuire had one piece of career advice for young Benjamin Braddock – plastics. Indeed. In the 40 years since “The Graduate,” plastic has exploded in applications, from car bumpers to computers, and it has been classified into seven types, including PET #1, the type used for plastic water and soda bottles. Now the looming question is what to do with all that plastic. Of the 2.7 million tons of plastic PET bottles on U.S. shelves in 2006, four-fifths went to landfills. Setting aside environmental concerns, the economic success or failure of plastics recycling relies on two variables: the cost of the raw materials used to make virgin plastic, petroleum and natural gas, and the cost of recycling versus the cost of disposal, which fluctuates based on a city’s proximity to recycling centers and the price to dump in local landfills. A University of California, Berkeley study estimated that areas like Los Angeles and San Francisco could gain an economic benefit of $200 a ton for recycling instead of dumping. Nonetheless, the cost of recycling a bottle versus making a new one simply varies, depending where the bottle is and what the capricious price of oil happens to be. Each year, 29 billion plastic water bottles are produced for use in the United States, according to the Earth Policy Institute, an environmental organization in Washington, D.C. Manufacturing them requires the equivalent of 17 million barrels of crude oil, so rising oil and natural gas prices have only exacerbated the high price of virgin plastic. Plastics News, a trade magazine, lists the recent price of PET virgin bottle resin pellets between 83 and 85 cents a pound, compared to only 58 to 66 cents a pound for PET recycled pellets. Yet escalating plastic prices have done little to curb demand. The amount of PET plastic on U.S. shelves has more than doubled in the last decade, according to the National Association for PET Container Resources (NAPCOR). The increase is a result of the surging demand for bottled water. In 2005, seven and a half billion gallons of water flooded U.S. shelves – roughly equivalent to the average amount of water that flows over Niagara Falls in three hours. That’s 21 times more bottled water than the amount available on shelves in 1976, according to U.S. government data. All that extra plastic, and the petroleum used to make it, is expensive. 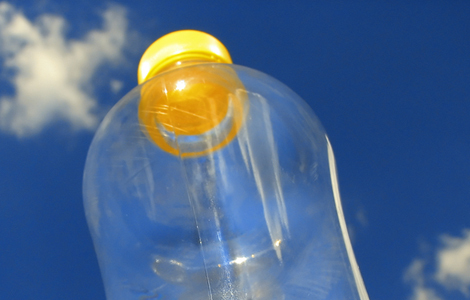 NAPCOR estimates that 5.5 billion pounds of PET bottles and jars passed over U.S. shelves in 2006. Making this many PET bottles and jars today from virgin plastic would cost $4.5 billion just for the raw materials, without considering the cost of operating bottle production plants. Prior to its reincarnation as industrial carpet or sleeping bag stuffing, a plastic bottle in the recycle bin has a long journey ahead of it. First it goes to a collection facility to be inspected for contaminants like rock or glass. Then it is washed and chopped into flakes. The flakes are dried and melted into plastic lava, which is filtered for impurities and formed into strands. Finally, the strands are cooled in water and chopped into pellets that can go to market. Landfills, however, are the final resting place for most bottles. Ostensibly this is the cheaper option. But landfill tipping fees, the dumping tariffs levied to offset the cost of creating, maintaining and closing a landfill, can be quite expensive compared to recycling. This is especially true in densely populated areas like the East Coast or areas like Florida with shallow water tables. In fact, fees can run from $10 a ton to over $100, according to Jerry Powell, editor of the trade publication Plastics Recycling Update. Additionally, dumping wastes a valuable commodity: In 2005, about half a billion dollars worth of PET bottles went to landfills, according to the Container Recycling Institute, a non-profit organization. Just a minor point — it’s not just industrial carpeting that you can make with recycled plastic. I put in very nice wall-to-wall carpeting last year that is 100% recycled plastic. You’d never know it! less food envelopment, and back to glass! Interessante, anche qui in italia ci stiamo chiedendo sempre più spesso dove finirà la plastica quando il nostro paese sarà completamente pieno! Anch’io tornerei volentieri al buon vecchio VETRO!! Chris, it is so curious that just yesterday I read an interesting editorial on the webpage of the most popular Italian newspaper, “Il Corriere della Sera”, regarding the battle of some important authorities in Venice against the unreasonable and expensive vogue of drinking bottled water. Remarkable the fact that these ideas come simultaneously from two so different men: the Patriarch of Venice (that obviously reports to the conservative Vatican City) and Massimo Cacciari (the progressive major of Venice). The Patriarch launched a campaign called “Imbrocchiamola” (that means more or less “let’s fill the pitcher”) that persuaded the waterworks company of Venice to send 100.000 Venetian families a pitcher, in order to urge people to drink tap water! The Major, on the other hand, decided to stop using bottled water during municipal meetings, and underlined the impact of the cost of bottled water on family budgets (3,2 billions euro is the turnover of the bottled water sector in Italy) . This line of conduct is becoming popular in Italy (also the famous actor Paolini is drinking only tap water during his performances) and it is an encouraging signal in a country literally covered with rubbish. One thing that is rarely mentioned about bottled water is the amount of pollution that is created when they are manufacturing the bottle and then how much pollution is created driving the water to the stores and then driving the empty bottles to landfill or recycling. Its a tremendous amount of pollution and its absolutely not necessary as water flows from a tap within a few feet of all the lazy dolts that drink bottled water. One way to make a statement is to buy only packages that use recycled PET in the content of the new packages. Some of the big companies are taking this initiative but not all. Check the web site of the product/company and look for their sustainability practice. Some companies say they promote recycling but don’t use the actual recycled materials. If a company is using recycled materials in their packaging they won’t be shy about stating this. If we boycott those who are not on board, they will be pressured into making recycling material a priority. It is now widely known that there are pharmaceuticals in much of our tap water, affecting wildlife and doing unknown damage to humans, potentially infants and children. So it sounds like the best option is to filtrate your tap water. What no news report seems to be answering though, is what is going to remove the pharmaceuticals from the tap water and can our store-bought filtration systems do the job or do the drugs pass right through? We do business about PET recycling, we bring the value in PET recycling, unlike the existing PET recycleing & processing plants adopting the not-responsible, interest-oriented technology. The used PET bottles, being the destined industral specifics, need to be recycled in an efficient channels to fulfill various solutions. We hereby welcome those who contribute their proposals concerning the efficient PET bottles recycling methodology in U.S.A. In Otero County, NM, USA, the only place that accepts PET 1 & 2 plastic bottles won’t take them anymore in a few months… this as 87 octane gas has now reached about $3.50 per gallon. A few people here are looking into this, hoping to set up a plastic recycle system regardless of the “cost-effectiveness” of it all. Do your own due dilligence on this and see for youerself. If we adopted a national deposit of 5 or 10 cents/can, then took the returned materials to be recycled, wouldn’t that solve the problem? Not so sure about this. I question an economic benefit argument for recycling when industry and individuals don’t do this on their own outside of government intervention. I just read through the study they cite in the posting and I have a number of questions regarding content that could distort the results of the study. 1) regarding the disposal costs, for example, if the tipping-fees discussed are inclusive of government taxes, especially of the nature of environmental impact fees and the like that might be unique to waste disposal, the tipping-fees become an unreliable measure of market cost of disposal relative to recycling plastic. This creates a scenario where: Government claims recycling is cheaper, government adds artificial costs to disposal business operations, government claims success in their claim. Hmmmm. I didn’t see where they adjusted for those sorts of things (granted I read quickly). 2) The employment numbers seem dubious as an argument for economic benefit. The study authors presume the creation of a job: any job is necessarily an economic benefit and it’s not. Other industries require labor and if the economic output of the of the labor is less than had that labor been available to some other work with a greater output, the recycling program would have reduced economic growth, not enhanced it. The study would have also been distorted by the issue raised in point 1 as well in terms of measuring worker productivity relative to costs. 3) The report itself says don’t use it for important monetary decisions because the report authors state that their data could contain enough error due to the collection methodology. 4) How does one determine the real environmental impact if you don’t control for these artificial pricing impacts? Truly free market prices = equipment costs + raw material costs + distribution costs + labor costs throughout the supply chain. And each cost element includes a raw materials/energy cost as well (i.e. workers need to get to work, equipment is made of stuff) If disposal on that basis is cheaper than recycling then recycling could very well have a negative environmental impact as well as economic impact. And if that’s true… why are we doing it? Too bad getting to a real answer could jeopardize the livelihood of very individuals that are paid to analyze the question; seems like another chance for a distorting effect. Sir’s, some elements of cost are glossed over or not discussed at all. One has to look at the cost from different perspectives: on a simple level, from the consumer’s perspective one could argue that it takes time to sort the trash, carry it to a different location/ container (and sometimes fuel), and added cost to store extra container(s) on property. From a municipality standpoint, added cost for more trucking and maintenance, storage of trucking, employees to operate the trucks, containers/ bins, and purchase of and maintaining bin locations. From a manufacturer point of view we know that one should only use about 15% recycled material (regrind) in process because of inherent changes in chemical properties and resultant processing challenges, added floor space for storage of the material, added equipment to process and prepare the material (dryers, grinders, etc), added energy costs to prepare, move and store the material, and additional employees to receive, manage, inspect, sort, handle, and process the material. From a pollution stand point one should readily see that with only 15% or less content being used, the added energy employed -cost- (Municipality trucking, maintenance, storage, employee usage for creature comforts while not transporting, as well as manufacturer energy use of employees, material transporting, preparation, storage, and processing) adds up to considerably more than 15% over the use of virgin material. Since the energy used is of late claimed to be directly correlated to resultant pollution, one can see that the resultant savings in land fill pollution is only transferred to air pollution. Therefore from a realistic look at costs, one can readily see that recycling plastic bottles for regular use is cost prohibitive on both a pollution and monetary basis. If on the other hand one considers the use for 100% recycled material such as in plastic lumber, construction materials etc, the cost to the manufacturer is much less; however, the cost to the consumer and the municipality is the same and they do not recoup the cost. In fact, these items made from 100 % recycled materials are typically 150% the cost of virgin material cost to the end user. The pollution cost is the same. A power that can affect, persuade and cause changes to someone or something. In order to influence people, you first need to discover what is already influencing them. What makes them tick? What do they care about? We need some leverage to work with when we’re trying to change how people think and behave.Just 20 years ago the market for plastic water bottles was practically nonexistent, but today we produce billions of these completely unnecessary products. There can be only one sane response, plastic water bottles must be banned! why did we change to start with? huh, dose any one know, I didnt thank so! it is lighter then glass , i do like plastic bottles in the tub, soap use to come in a bar, of course toothpaste came a lead tin thing many years ago. I say we band all plastic dippers. Regarding comments 18 and 22… 18: this article does not talk about global warming. this article talks about pollution. i don’t think global warming is happening either, but we still need to protect our plant. and 22: these are real issues. if you think it’s BS then why are you reading it? Bottled water in plastic containers should be outlawed, except for the one gallon size for emergency use. We have enough plastics from other manufactured goods. We don’t have any need for this additional burden on the environment. If you put a $0.02 refund on every plastic item (50 toothbrushes, water bottles, plastic bags,shampoo bottles, etc would be worth $1.00).I guarentee that will reduce the amount of plastics going into landfills and our oceans. I look for treasure everywhere and never find any 5 cent returnable Coke or Pepsi bottles in any homestead trash piles, or anywhere else for that matter, that’s because they had value, and I know that a poor person (me) will do anything to make a buck to feed their family. OK yes that may raise the price of the item being sold, but it may also get people to think twice about buying the item in the first place and or they may buy the items with the return value knowing they can at least make a few cents off it, and why can’t someone( I would do it if I had the Money) make attractive vermon and water proof containers with wheels to store the plastic items, out of the plastic in landfills and the Plastic Continents that could be traded for new empty containers after they get filled up, because realistically, it is hard to recycle. because people in the neighborhoods complain about the site of all these little recycle containers that draw in the vermen with no tops. Also all those trips to the recyle places cost gas and time. I find it’s easier to just throw it away, and that is the problem, but I recyle all aluminum cans and steel because it has value. From now on all paper, cardboard, plastic, rubber, aluminum , steel, glass, wood, has value and if we save it anualy, and then it is collected, sorted,and reused that money can go into a volenteer “Pay off the World Debt Fund”, I know! no one cares, Oh well! Why should I., but starting the first of January I will save all the plastic in a big pile in my back yard, just to show the world how much plastic is consumed by one family in a year., well, no my wife just said not in my back yard, so see there is no easy solution. I AM INTERESTED IN INVESTING IN THE PLASTIC RECYCLING BUSSINESS, IN ONTARIO CANADA. I WNAT TO BE PRODUCING PLASTIC PELLETS. IS THER READY MARKET FOR IT ? how much does it cost to recycle a plastic bottle. Im doing a project for school. Everything should not be looked at in $ only. Governments should take corrective action to reduce plastics from waste stream, further damage will become too costly. Where is land for land fills? We are running into serious conflict with nature by recklessly using up resources. Its time to remedy if not reverse at least. This is a good article! Great for students! what is the cost of bottles? What is the cost Of plastic bottles ????? I just want to know the cost of recycling a stupid plastic bottle…. Does everybody else obtain an fault in the browser after this page loads when using the current FireFox? This amazing site in no way used to do this previously. I know this article was about plastic not global warming (which is pretty much a scam) but my first thought is what are energy cost for recycling vs. the energy cost of just making a new bottle? All of the energy needed has to come from somewhere and realistically most of it comes from fossil fuels. I have a very easy solution for dealing with any of the plastic bottles my family uses I burn them, but I live out in the sticks. I can say we live very green since we put next to nothing in the landfill but I pretty sure there are some that would whine about the smoke coming from my burn can. As for some people mentioning going back to glass I think that comes back to energy to. If you are shipping a cargo container of water, or some other liquid obviously the plastic is going to weigh less than glass and consume less energy to move. I really doubt going back to glass would be a very realistic solution. Why not use recycled plastics, for building purposes? I bought hard plastic, boards from a company going out of business, that built heavy picnic tables. When remodeling , I HAD ABOUT 25, AND TOLD CARPENTERS, I wanted the deck made out of the boards, IT has been 8 years now, no rot, and the color of boards, went well with everything, I LOVE IT. Why not build homes, with hard plastic, new wave of future homes to be built, that termites will not get into. last longer, more sturdy, even in stormy weather. recycle, plastics, into 4 by 4, 2 by 4, and all sizes like wood, The wood carpenters used already is going, but not the plastic. it can even be painted over.